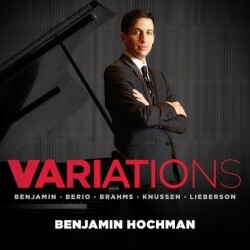 Pianist Benjamin Hochman follows his critically acclaimed AVIE debut Homge to Schubert (AV 2281) – which paired two sonatas by the 19th century master with modern day tributes by Kurtág and Widmann – with a like-minded program centered on the age-old musical form of variations. At the heart of the album is Handel Variations by Brahms, a grand master of the art form. The four shorter Piano Variations on this recording are by major composers of the late 20th and early 21st century: Oliver Knussen, Luciano Berio, George Benjamin and Peter Lieberson. Each composition is a piece of great beauty but with results that are strikingly diverse.